ORTLIEB‘s Frame-Pack Toptube is the ideal solution for those who want to bring along a drinking bottle and still wish to store baggage in the frame triangle. The waterproof frame pack is perfect for full suspension mountain bikes with shock absorbers limiting space inside the frame triangle. This bag of ORTLIEB‘s bikepacking collection features a waterproof zipper with IP67 standard keeping gear dry even during river crossings. The Frame-Pack Toptube has a 4 L volume permitting storage of heavy equipment such as tent poles, tools or food in the frame triangle thus keeping the centre of gravity low. 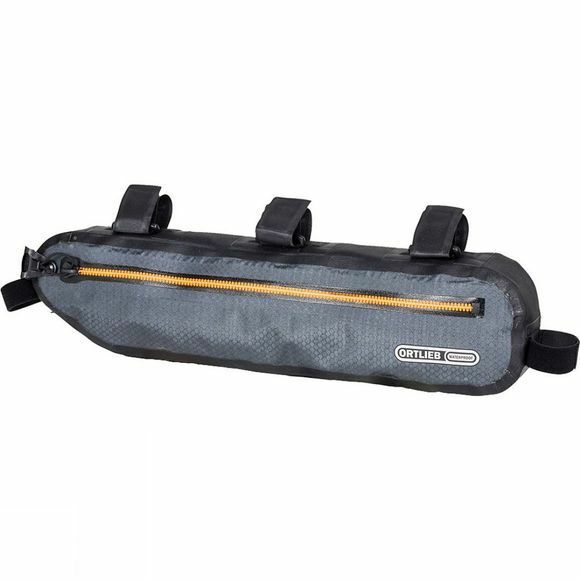 Stable and strong Velcro closures allow simple and easy mounting of the pack to the top or seat tube of your bicycle. Frame-Pack Toptube is PVC-free and made in Germany. In combination with ORTLIEB‘s further bikepacking series it is the perfect gear for micro adventures, self supported races or the next adventure. Maximum load 3 kg/6.6 lbs.